NIM is an excellent feature of the AIX operating system and is very important for teams or companies that have a need to install or upgrade many RS/6000 machines with the same images at the same time. NIM features continue to improve as new versions of AIX appear. This IBM Redbooks publication will provide users with an understanding of NIM and its application in today’s large-scale multiplatform distributed network environments. 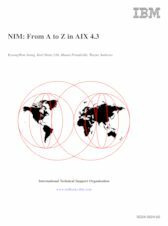 Our focus is on the capabilities of NIM, and, with that in mind, we have devoted a section to case studies of NIM usage in AIX Version 4.3 on multiple RS/6000 and SP systems. This book will be a valuable tool for system administrators and other technical support personnel and is tailored to their needs. This book is a definitive guide to NIM. It begins with the design concepts, implementation, and benefits of using NIM for managing networked AIX systems. It then explains in detail (and with a pronounced practical bias) how to install, configure, and use NIM to manage connected machines. This book contains many step-by-step examples of typical implementation scenarios.